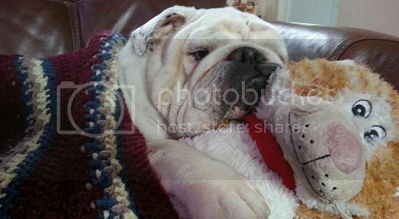 English Bulldog News Forums - January 2013 Photo of the Month Contest Winners! January 2013 Photo of the Month Contest Winners! Congratulations to sheshistory, the winner of our January 2013 contest! Oh my! I'm so honoured, thank you for all who voted. Usko is my pride and joy! Love them both! This was a tough months contest for sure! Congrats!! Awh, so cute! Love it! Congrats winners, those are great photos! 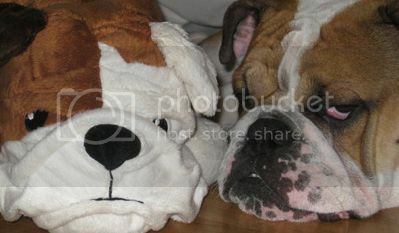 Linus and I are honored, especially in a contest with such great photos! Congrats @RiiSi too! So cute! I don't think it was fair that this was the first contest I had to vote in.....it was so stinking HARD!!!! Congratulations winners (although I think everyone who looked at those pictures wins)!!!!! Congratulations to both of you, great pictures! Congrats the the winners, very well deserved. Congrats to the winners, very good pics. It gets harder and harder to vote as we have a lot of great pics entered. Congrats to you both! Great pics everyone! Congrats!! The competition was especially tough this month. So many of the pics entered had the potential to be winners. Congratulations to the winners!, love both of them, but then again I loved ALL of them.